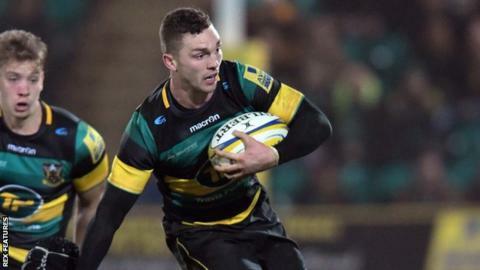 World Rugby says it is "disappointed" by Northampton Saints' "failure to identify and manage" George North's recent head injury "appropriately". The Wales wing, 24, appeared motionless after a mid-air tackle in the loss to Leicester on 3 December, but played on. A concussion panel review last month concluded North should not have played on, but did not sanction Saints. The BBC contacted Saints, who referred back to previous statements when they "accepted" the panel's decision. Saints had also previously said the club was "encouraged to see that the CMRG (panel review) has found that the medics had nothing other than player welfare in mind during this incident". After the panel's findings, World Rugby wanted more information and has since held "highly constructive" talks with governing bodies. Following these discussions with the Rugby Football Union and Premiership Rugby, a World Rugby statement reiterated head injury protocols were "not fully adhered to", with the main reason given that Saints medical staff were evaluating a potential spinal injury. North's later resumption in play was caused by the "non-application" of these protocols, according to the statement, but World Rugby now says it is "satisfied" the club's medical staff have been educated on the permanent removal process. The statement continued: "While it is impossible to completely remove the risk of error, World Rugby remains disappointed that there was a failure in this case to identify and manage the injury appropriately, in particular considering North's medical history." North previously suffered four head blows in five months between November 2014 and March 2015, leading to a spell on the sidelines that lasted from 27 March until 29 August. Premiership Rugby welcomed the support for their strategy to deal with head injuries. "Within the English game - and in collaboration with the RFU and RPA (Rugby Players' Association) - we are setting new standards in dealing with concussion risk in education, prevention and treatment, and driving a change of culture in the game," said a spokesman. "We are 100% behind our clubs in the way they have tackled concussion - player welfare is theirs and our number one priority." Complete compliance with the mandatory six-point head injury education, prevention, and management programme as outlined within the conditions of use of the HIA (Head Injury Assessment) tool. Any clear or suspected symptom of concussion results in immediate and permanent removal of the player from the match or training session. The HIA is not applicable where a symptom of suspected concussion is observed - Recognise and Remove. Individual risk stratification of players as outlined in the conditions of HIA adoption is a priority and all management should undertake concussion education as outlined on World Rugby's player welfare website. Unions and competition owners are aware of their obligation under the conditions of HIA adoption that untoward incident reviews should operate where there are cases of apparent non-compliance with rugby's head injury protocols. They prioritise Recognise and Remove education via social and digital platforms to educate the entire rugby community in the importance of recognising symptoms and immediately permanently removing any players with clear or suspected symptoms from playing or training. After the report of the concussion panel review was published last month, Northampton said in a statement that they "accept the conclusion that George should not have been allowed to return to the field of play, but are pleased that the CMRG has reflected our concerns about the current technologies and processes available to medical teams when assessing concussion". The statement added: "The club believes that this is now an opportunity for the whole rugby community to reflect on the CMRG's recommendations to ensure the highest levels of player safety and well-being."